On our last trip to San Francisco, we stayed at the Fairmount Hotel on Nob Hill. Once upon a time this was the hotel in San Francisco, and while it’s a bit dated and slightly shabby around the edges, it’s still pretty nice. I mean sure, you can have your Four Seasons or Peninsula hotels with their sleekness, and quiet money scented elegance, and their obsequious service that strives to be unobtrusive, yet able to anticipate your every need, even the ones you didn’t know you had. But there’s a place too for a genteel and wealthy place like the Fairmont. Kind of like a beloved, slightly dotty old aunt who hasn’t changed a bit of décor in her home since 1954, but she’s loaded, so no one says anything about it. Unlike a lot of places, the Fairmount embraces their history, and there’s a lot of it to get your arms around. I won’t go into details, but the Fairmont was there for pretty much everything that happened in San Francisco since before the Great Earthquake. Among the oddities in the hotel is a Tiki bar slash restaurant. There also used to be a merry-go-round bar too, but that sadly is long gone, though interestingly, the room it was in still exists, pretty much unchanged, though sadly sans carousel. The Tiki bar is called the Tonga Room and it’s still going strong. Really strong, like a line of fifty or so people waiting to get into the bar at eight o’clock on a Saturday night, kind of strong. Opened in 1945, it’s been serving fruity tropical drinks with little umbrellas for more than 65 years now. Why that’s older than me! I like things older than me. Especially things older than me that are still in business, because one day soon, when they’re carting me off to the Old Age Home, that I suppose we have to refer to as the Assisted Living Facility these days, I’ll be able to say, “Hey wait a minute! There’s a Tiki bar older than me that’s still in business so you don’t have to take me away just yet!” And Mary will exchange a knowing look with the attendants who are buckling me in, who in my nightmares are all wearing white coats, something I bet they haven’t done in decades. Oh, dear god, I am getting old! Mary loves Tiki bars. Mary loves Tiki bars so much that she has, on many an occasion, dragged me across town to go to one. Now she’s graduated to dragging me across several state lines. If she hears of a Tiki bar in Singapore or somewhere like that, I’m sure I’ll be on a plane sooner or later and going intercontinental. The Tonga Room was, as hoped, basically pretty awesome. The drinks were abundantly tropical, fruity and coconutty, as appropriate. 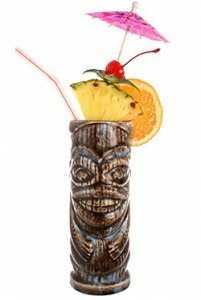 Alcohol content was sky high which is a good thing in a situation like this, because you’re in a tiki bar! Barkeep, more liquor! We liked the food, even though it’s only peripherally related to the old ‘Polynesian’ cuisine of old. Sadly, there wasn’t a pu-pu platter in sight, which I sorta miss. Ahh, Crab Rangoon, honey soy glazed chicken wings, bacon wrapped around a piece of pineapple. Sweet, sweet, Eisenhower era bliss. In the middle of the restaurant there was an old pool, that had been converted into an old pool with a band stand floating in it. The band was surprisingly good even though a majority of their repertoire came from the Seventies, and not the Seventies that gave us classics like Led Zeppelin’s “Stairway to Heaven” or Pink Floyd’s “Comfortably Numb”. No, these were the Seventies tunes you heard a thousand times (if you lived, or even just survived through the 70’s) and each time you wanted to take a ball peen hammer and smash the radio. Stuff like well, I can’t remember now, but horrible stuff. Real Geneva Convention Crimes Against Humanity stuff. It was kind of catchy. You know how it goes. So Tonga Room is, in pretty much all respects, a good time. Have three Blue Hawaii’s and you probably won’t even remember it.